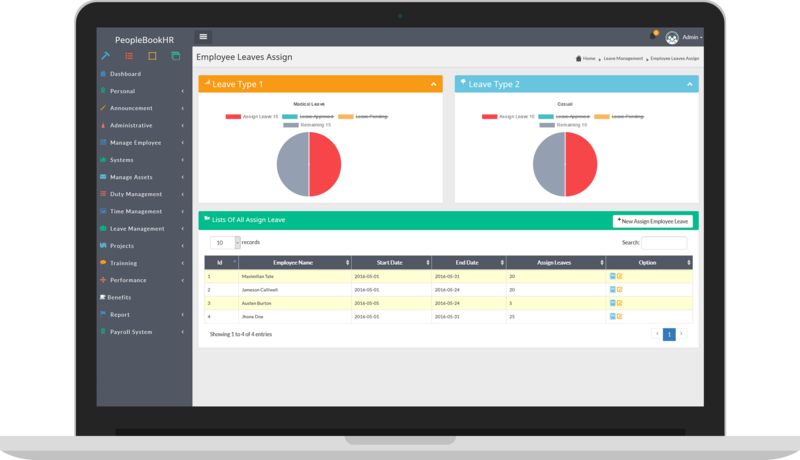 Associating with other HR management solutions, this administration module is packed with tools to enable smooth and organized HR management. Access information wherever you are in the world. 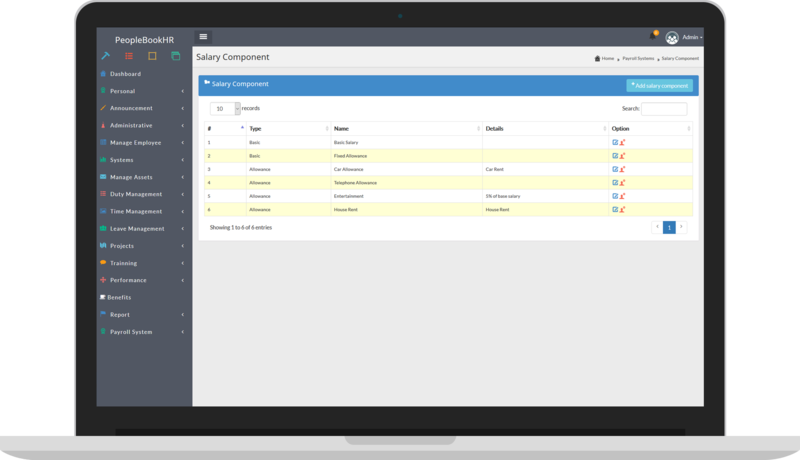 Manage employee Leave requests with ease using our HRM module. 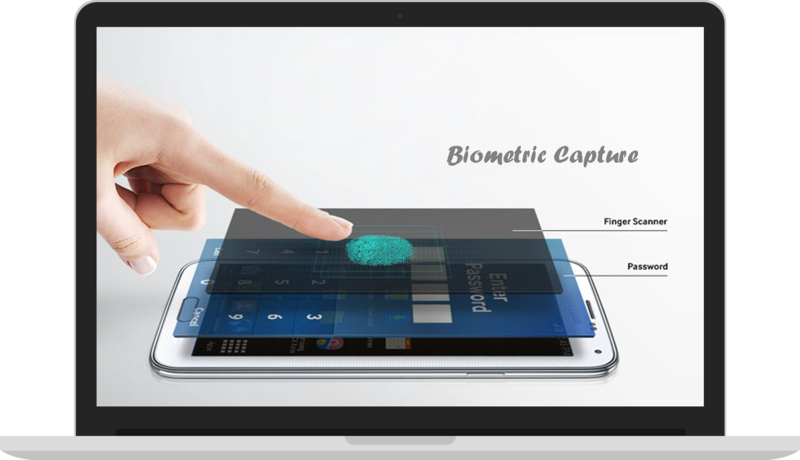 It is extremely difficult to integrate HR software applications with biometric devices, but PeopleBookHR has done it. 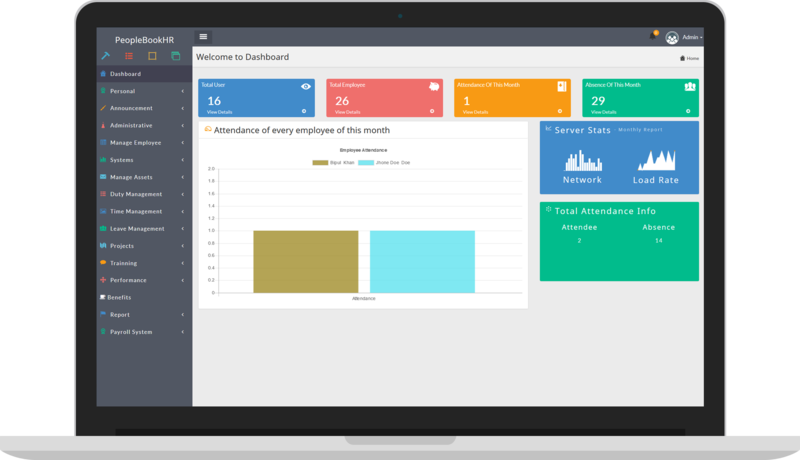 Record time and attendance data, save valuable HR time and eliminate confusion regarding workforce attendance. Acquire data entered physically or through upload. The evaluation of employee performance is a vital for any organization. Issues or faults can be found and addressed accordingly. 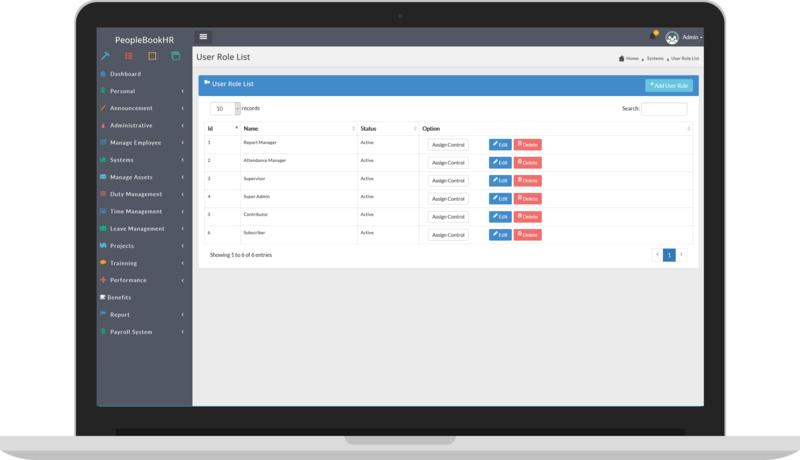 To make a smooth payment flow for employee PeopleBookHR will also include payroll option where employee payment management will be done very easily and hassle free. Another exclusive component this human management software possesses is its own training unit. 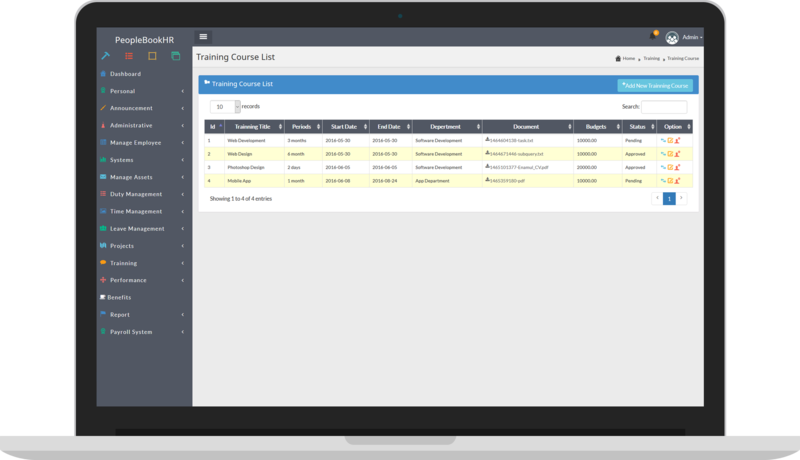 This feature-rich element enables administrators and supervisors to create and manage employee training courses. The document manager is a system wide feature which allows HR documentation to be generated from various points in the system. It is important to document all steps associated with handling discipline. Now with this HR feature you can track and maintain all cases and actions with ease. Employees within the organization can easily access information related to payouts, income tax, leave status, company policies etc. They can view their pay slips, total earnings, Provident Fund and Year-To-Date statements. Details related to loans like installments paid, balance payable, and so on can also be viewed without having to wait for HR reverts. Thus, you spend less time answering questions and more time pursuing your vision. Along with these features, employees will be able to socialize with one another. They will be able send messages, post, comment, and so much more. This feature is completely absent in other HR software solutions. PeopleBookHR takes the nightmare out of shift management. 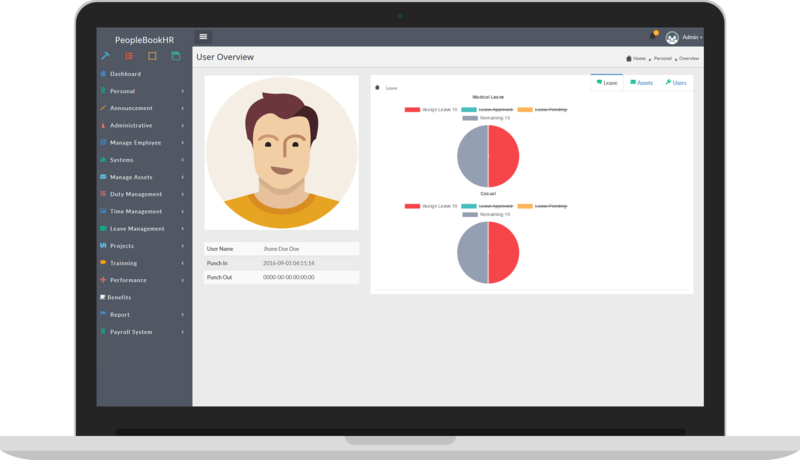 Attendance for different shifts is automatically managed, as well as different overtime rates and allowances for each shift. Similarly, factory rosters can be set up, either on a rotating basis or a non-rotating basis, and shift patterns can also be defined. Attendance data is analyzed with the defined rosters of employees and the days absent, overtime, allowances and so forth are calculated automatically. Asset management maintains a record of property issued to employees. This could include laptops, pagers, uniforms, cell phones, key cards, etc. Information in the employee asset record comprises of the asset type, number, serial number and date of issuance. As far as HR software applications go, PeopleBookHR has countless. Further customization can be done upon consumer request. What other human management software will offer this service?